I’m a big fan of downtown Columbus, OH. Many readers may have been to the Hyatt Regency Hotel, attached to the south end of the Columbus Convention Center, from trips to Origins Game Fair. 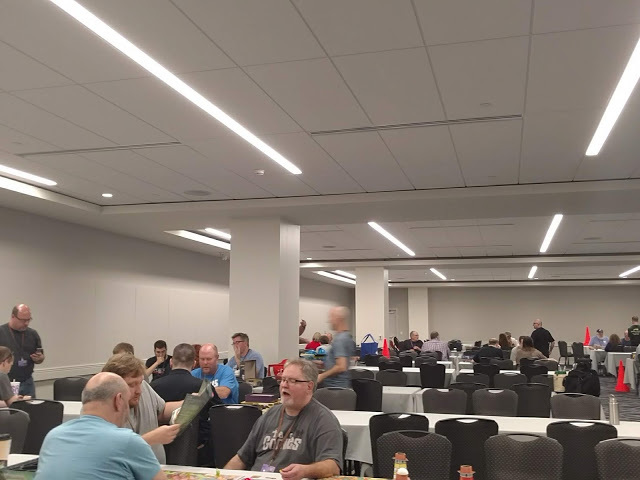 This year, Buckeye Game Fest, a regional board gaming convention, was moved to downtown to that Hyatt. 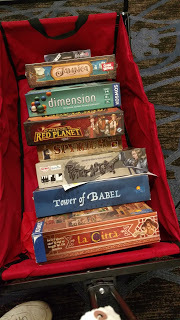 This convention is run by the Columbus Board Gaming Society (CABS), who has a significant game library -- the same library that they provide for Origins. Being a “local” and smaller con, this a is also a convention my wife has attended with me in the past, and thought she would again this year. To my surprise, I was contacted and asked to be a special guest, and was offered passes for the weekend in return for a bio. That seemed like a fair trade since I was going anyway. My wife and I had made plans to go up Saturday and spend the night at the Hyatt. I decided to go up for part of Friday on my own. The convention had a great pre-paid parking option at the south parking garage, so you could guarantee a spot. It’s a good thing I used this, because shortly after I arrived I heard it was full -- not that there aren’t plenty of other lots, this one is super convenient. I arrived right about 9am when the registration was due to open. After a few hiccups with finding WiFi and educating the day’s volunteer, I got my badge. I was pleasantly surprised that as a special guest I still got one of the random give away games. I won Power Grid: Factory Manager, which I seem to remember playing in the past, although I can’t remember if I liked it. 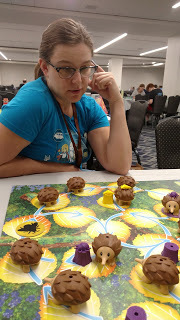 I also picked up my wife’s badge, and she won a copy of Hermagor. As I was checking in, my pal Cassadi Thomas from The Shuffle showed up. We decided to try Echidna Shuffle from the ‘Play to Win’ area. I had heard of ‘Play to Win’ games before -- games that every time you play you get your name in a raffle to win. Then we checked out El Grande from the library, so I could teach it to her. We pulled out one of the “players wanted” traffic cones and put it on the table with the box top on it looking for players. In the meantime, I taught Cassadi the new Button Shy microgame Sprawlopolis, one of the few games from my bag, since I knew they’d have such a good library. Some of Cassadi’s friends joined us for El Grande and we had a good time with it. We ended about noon and I met up with Jason Hall. We discussed grabbing lunch and decided to head out to the infamous North Market. 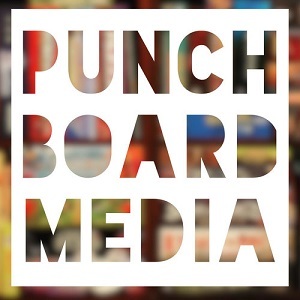 We swung by my car in it’s primo spot and dropped of my new games and Jason’s bag and headed to the market. I hit my favorites -- Herbert’s Polish and Jeni’s Ice Cream. Jason and I returned and played a few smaller games waiting on the others. 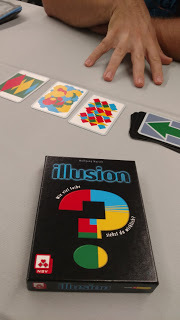 Illusion, which I liked a lot, and Circle the Wagons, another microgame from Button Shy. Then Cassadi joined us and we played a game of Broom Service. A hot Alexander Pfister game from a few years ago that neither Cassadi or I had played yet. I liked it quite a bit. With about an hour left to spare, I suggested Arboretum to end the day. I grabbed a coffee from the great local coffee shop in the lobby and started my drive home. Cindi and I arrived and started off with my new game Gizmos. While we were figuring things out, Cassadi showed up and joined us. Gizmos is a solid engine builder with a marble-dropping mechanism similar to Potion Explosion, but the marble pulling is not as major a part of the game. 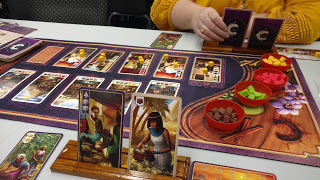 Cindi wanted to play something she knew, so we checked out Century: Spice Road from the library. They had the player mat, which we don’t, and I pulled out my “Dinger brand” card holders, and we had a premium game of Century going. Dr. Jim and my old friend Anson joined us. We then took a quick lunch at the food court. I tried something new a the noodle shop -- not too bad. On the way back from lunch, I swung through the consignment store. This is a pretty great part of the convention, folks can add whatever they want to the table for sale. The sale has three time periods -- opening time, then a reduced cost about 45 minutes later, then a final cost 45 minutes after that. I didn’t find anything I couldn’t live without. Anson was selling stuff and seemed to do okay with it. I returned Century and perused the library for a four-player game, choosing Yspahan. I’ve only played a few times, and experimented with sending my own cubes to the caravan track. I came in close second. Switching back to known games, Cindi suggested Arboretum. After that we had a little bit of time until the math trade, and we pulled out Five Crowns. While reviewing the rules, we realized we had been playing it wrong all this time and didn’t have time to finish. We packed up and got checked into the Hyatt and I grabbed my games for the trade. This was my first math trade. About six of us met in the lobby and traded our games pretty quickly. I was pretty happy with the trades I made. Maybe they were not perfect value trades, but still were things I had on my unplayed shelf I was able to trade for things I wanted to try - see my results in the picture. Cindi and I went out for a nice dinner. She had done enough gaming and retired to the room. I returned to the game room to find my pals had started a game of Through the Ages without me. It looked like it would be ages... until I’d have a game with them. I looked around and didn’t see anyone with cones looking for games, so I set up my own at the next table and watched them for a bit. Lori joined me and asked if I was looking for someone to play with, she also was too late to join her friends. I started by teaching her Akrotiri -- one of my favorite two-player games. I had hoped to find Jaipur in the library, but they didn’t have it so I grabbed NMBR 9. Then Lori grabbed Azul. I was pretty tired at this point and called it a night, passing the usual Werewolf crowds in the lobby. Cindi and I woke up a little later. After, we fueled up and made it to a less-crowded game room. There was a guy looking for players for Terraforming Mars but we were not up that long of a game. Cindi grabbed Azul. 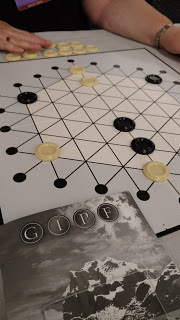 Then I checked the library list for two-player games and came up with GIPF, which I’ve heard about a lot. We decided to call it a day after that and explore some more of Columbus, but that may be for another blog. Artemis Bridge Simulator Room -- I didn’t think this was something Cindi would like. Scheduled Events -- I just didn’t have time in advance, and with my wife with me I wasn’t sure what to schedule. Game Raffle — I just didn’t take the time to look at it. Also, in the past the reading of the tickets was a hassle. They resolved it this year by only announcing the big winners and posting the smaller prizes on board. Retail Area -- since I was getting a cart of new-to-me games I wasn’t really out to buy a bunch of new stuff, plus the major retailer is my FLGS, and I can get all of that stuff at home anyway. Location -- Having stayed at the Hyatt for Origins, I way happy with it as the new location and game spaces. Library -- They had a printout sorted by time, player count, etc. so you could find a game to play. Attendance - appeared down, from my own observation and discussion with others. This could the due to the change in venues, the increased hotel cost, or maybe it being the same weekend as Grand Con, a similar sized con not too far away. Hard to find open games. Most of the attendees are regular CABS members who know each other. Even with the “looking for player” cone system, there were not that games available or people looking when I had cones out. The online library was not accurate. Next year is already scheduled at the same location and I am looking to return.